Holy Spirit Tableau - 10.5"
Holy Spirit Tableau - 7"
Size: 7 x 7 NEW! 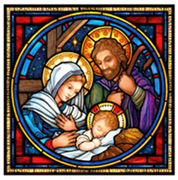 Randy Wollenmann created this brightly colored and richly detailed image of the Holy Family. This stained glass design gives the decorative feel of the Elizabethan Era with traditionally embellished halos and border motifs. The infant Jesus is depicted in a unique and untraditional way — sleeping peacefully on his side with the loving hand his mother Mary nearby and St. Joseph ever watchful. Randy Wollenmann has been working in the decorative arts for over 30 years developing artwork for a broad range of markets. His first years were spent with Abbey Press, owned by the Benedictine Monks of the St. Meinrad Arch Abbey, where he set the direction his work would take. Over the years, Randy has developed a diverse collection of artwork with many images coming back time and time again to the inspiring designs and vivid colors of stained glass.